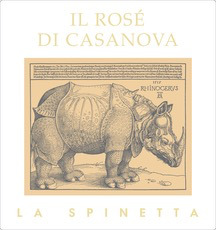 Wine Casanova della Spinetta Toscana Rose 2018 - Royal Wine Merchants - Happy to Offer! The master of Barbera in Piedmont, Giorgio Rivetti, has taken his magic touch to Tuscany. His Spinetta Rosé is the ultimate way to round out your gorgeous Summer Days! Get out your Proscuitto!